The term Napoli Napolissima is a cliché from centuries past and was also used as the title of a literary journal founded by Benedetto Croce in 1892. Many of the surfaces of the villa are adorned with friezes and bas-relief of abundant floral patterns ornamenting either cherub or satyr-like heads and faces. They recall figures of pastoral mythology, and, indeed, are typical of Liberty-style architecture in Naples as well as in general statuary from the same period (the late 1800s) found elsewhere in the city, such as in the Villa Comunale. 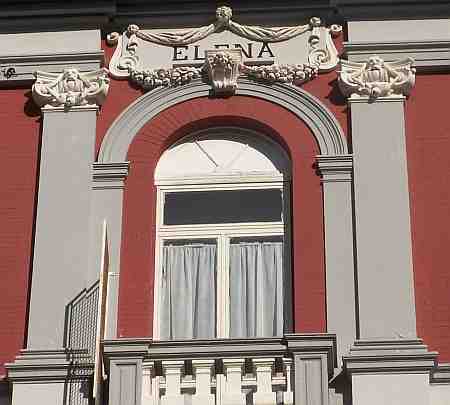 The balconies have either solid balustrades or ornately scrolled wrought iron railings. The central Liberty-style main section contrasts abruptly with the two side-sections, neo-classically bare and plain. 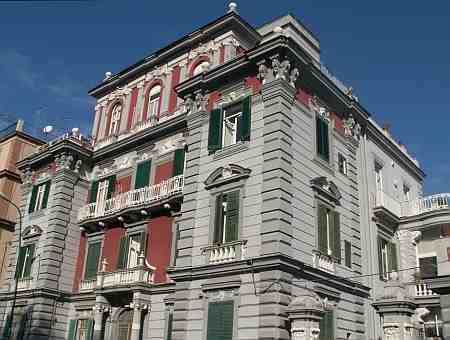 That combination shows what was meant by "eclecticism" in the architecture of 1900 in Naples. The engineer and architect were Michele Capo (1873-1956) and Ettore Bernich (1850-1914), respectively. The latter was also the architect of the well-known Roman Aquarium in Rome, and was later in his life active in Naples and the south, where he was particularly interested in the restoration of monuments and cathedrals in Puglia.